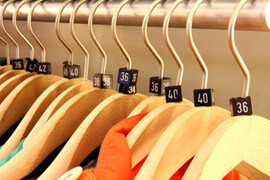 What body weight equates to what clothes size? It's a question members often ask! So we called on top image consultant for 30 years Alicia Kite for advice. "It's a good question but one that is impossible to answer unfortunately! We all carry our weight in different places. For some of us, it's on our bottoms, others on our thighs and others on our tummies. Some people are straight up and down with no waist, others have a more triangular shape with shoulders wider than hips, and whereas others have a perfectly balanced hourglass figure. The way we distribute our weight is what makes our unique body shape. Height, as well as where you carry your weight, plays a big part too. Just to illustrate the point about how difficult this question is to answer, have a read of this post on netmums.com about weight vrs dress size where women share their statistics. The range is huge, even in this small sample! Companies such as Bodymetrics use 3-D body scanners to capture body shape data and sell it to fashion companies for making pattern blocks, however as far as we know, these scanners only record height and girth measurements not body weight data. It would be great if we knew exactly what weight you'd need to be to fit into a certain dress size - it would certainly provide motivation when trying to lose weight! But the answer is that we are all different. And so we should be".